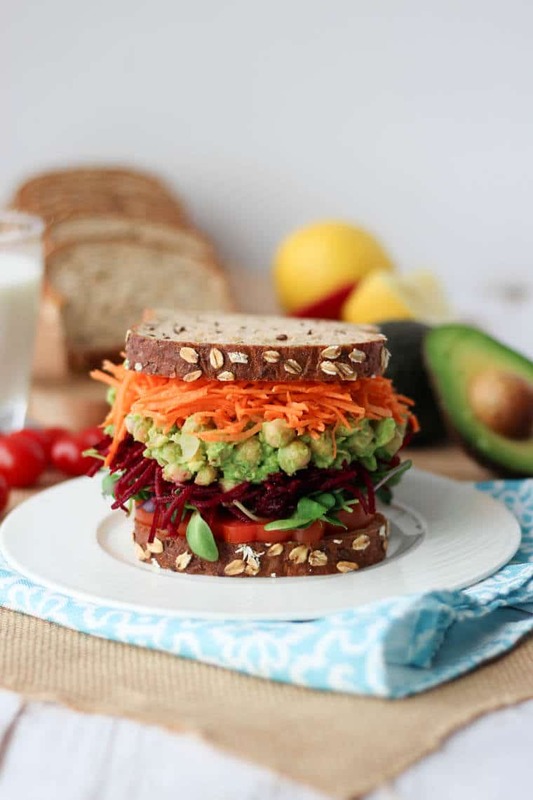 This avocado chickpea salad sandwich is loaded with a ton of colour, crunch and nutrition! 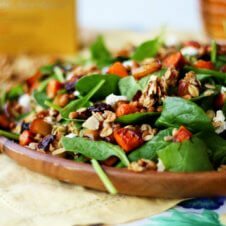 It’s the perfect vegan chicken salad swap! Chicken salad, egg salad, tuna salad or whatever other mayo-laden salad you could dream up were staples growing up. I was always a bit skeptical of them all because the texture weirded me out, but as an adult, I can’t help but totally love them all. But let’s be honest- we’re not all spring chickens anymore. I can’t always justify all of the fat, calories and salt packed into your typical chicken salad sandwich. SO I set out to make a better for you vegan chicken salad swap – the avocado chickpea salad sandwich. Seriously, if you say chickpea salad sandwich fast enough, no one will even know the difference. Your waistline, however, will. 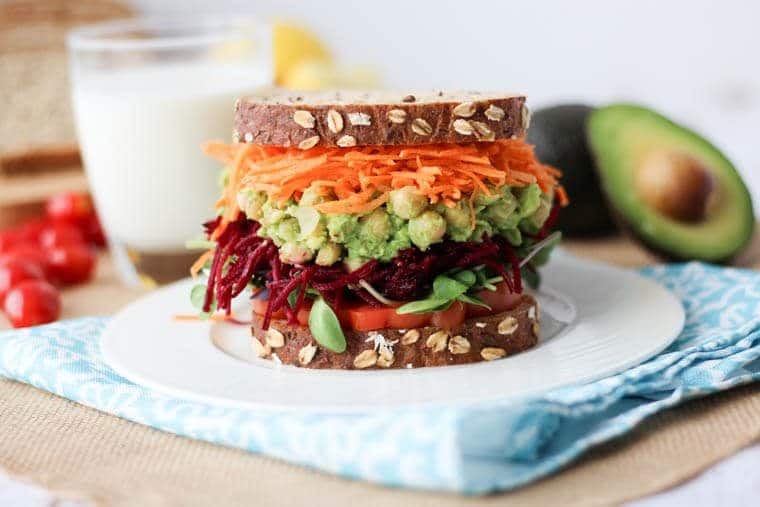 This avocado chickpea salad sandwich is so simple to pull off and really comes together with whatever veg you’ve got in your fridge. I mix together mashed ripe avocado with canned chickpeas, lemon and a little hot chili. It’s kind of like a lazy guacamole. This vegan chicken salad swap is awesome all on its own, but let’s not stop there. Then, I load this avocado chickpea salad sandwich right up. Sliced ripe heirloom tomato, microgreens, shredded cooked beets and shredded carrots. 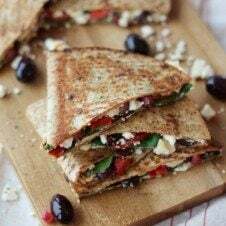 Seriously- could you imagine a more beautiful sandwich? Now, if you’re in the mood for chicken salad, will this do the trick? Probably not. It’s really not the same, just a take on the concept. But I kind of like the supple texture of the chickpeas with the creamy mildly sweet flavor of the avocado. It’s lighter, brighter and holy hell, it’s good with all the fixins’. What would you put on your avocado chickpea salad sandwich? 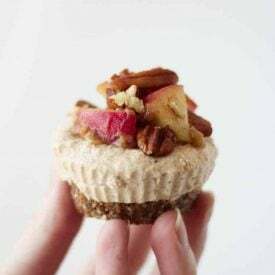 Leave me a comment below with your favourite sandwich toppers! In a bowl, mash the avocado until fairly smooth, add in the lemon juice, hot chili pepper, and chickpeas. Season with salt and pepper. 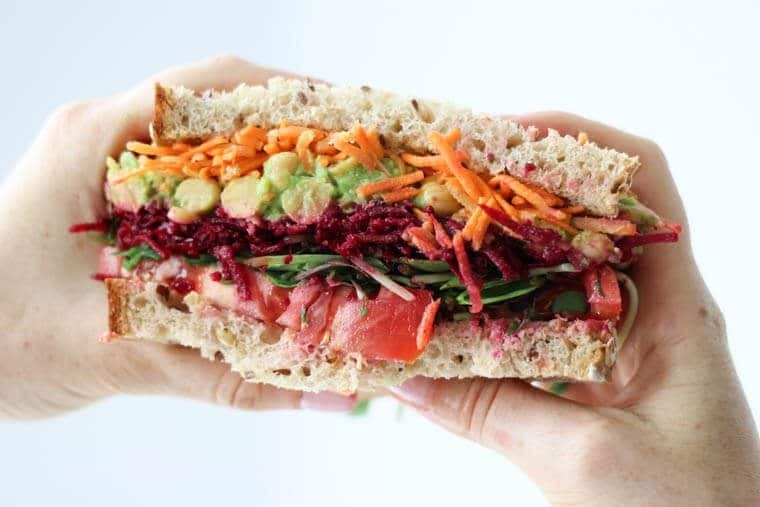 To assemble the sandwich, layer the slices of tomatoes on one slice of bread, add the microgreens, the beets, the chickpea salad and the carrots. Slice into the bad boy and enjoy! I am all about avocados, haha. This looks delicious–I love all the colors! :]!! Never would’ve thought to use chickpeas as a white meat sub, but this is such a great idea! The sandwich looks amazing! All sandwiches stacked 4 inches high, my way please. Yum! I’m with Kristina, that sandwich should be on an art display somewhere! This sandwich is beautiful! I can’t wait to make it. I love all the colors in it! This sandwich is almost too pretty to eat! I still would though, looks amazing! This looks great! I’ve done avo-chickpea sandwiches a few times, but never thought to add in some shredded beets. I bet that takes it to the next level! That is definitely not a boring sandwich! I wonder if I could fit all the goodness in my mouth at once. Probably not but I’d try! This is a great alternative for vegetarians! I am totally going to share this with all my vegetarian clients. Thanks Abbey! Now that’s one stacked sandwich! Looks great! All of my favorites in one sandwich…Yes and PLEASE! I’ll take one, thanks! This sandwich is so pretty!! I’d gobble it up in seconds. Also, I too love using chickpeas as a vegetarian sub for white meat. Makes me happy enough!